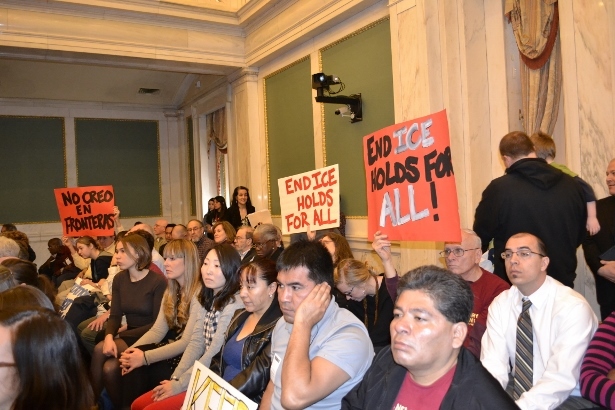 Philadelphia's ending of ICE holds is a result of smart, dedicated organizing. How they fought and won offers lessons for the entire national movement. Last week Philadelphia’s Mayor Michael Nutter signed into law one of the most progressive pieces of legislation limiting “ICE holds,” the practice of local police detaining individuals so they can be handed over to U.S. Immigration and Customs Enforcement — eliminating the practice for both city police and the city’s prisons. Limiting ICE holds is a major campaign victory in the movement to enfranchise undocumented residents. It is also a win for folks with papers but without citizenship, who get caught in the dragnet of mass deportation, like refugees. ICE holds instill fear among undocumented residents, as Teresa Flores explained at a City Council hearing. Teresa spoke of her undocumented son loaning money to a U.S. friend. When her son tried to collect the money, the friend called the police saying he had threatened him with a weapon. The police arrested her son. Then, ICE put a hold on him, and he was deported. ICE holds are voluntary by the city, costly (a cost born by cash-strapped cities), and widely practiced. In 2011, nearly half a million people were put in ICE holds. As is the story behind most meaningful victories, Philadelphia’s ending of ICE holds is a result of smart, dedicated organizing. How they fought and won offers lessons for the entire national movement. Five years ago it was hard to imagine that Philadelphia would pass what advocates are now calling “one of the most progressive pieces of legislation” in the nation. 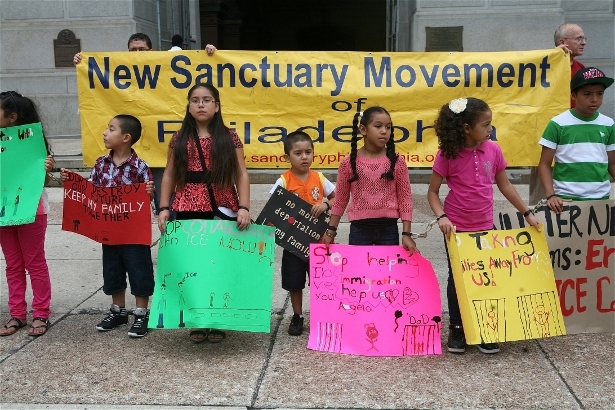 At that time a coalition of immigrant rights groups and advocacy organizations had asked Mayor Nutter to restrict ICE holds and limit ICE’s access to Philadelphia’s database of who is in custody. After initially scoffing at the idea, Mayor Nutter eventually offered a concession: to eliminate ICE holds for victims and witnesses. Members of the coalition reacted differently. Some were pleased. Others were not. If it’s inhumane to separate families merely because someone was a victims of a crime that got reported to the police, they argued, how is it any better merely because they are accused of a crime? The initial coalition fractured over this concession. And while Mayor Nutter did implement his concession, a handful of the coalition members decided to restart the campaign, naming themselves the Philadelphia Family Unity Network, or PFUN. They would build a unified coalition that’s for everybody held by ICE holds — not throwing anybody under the bus. 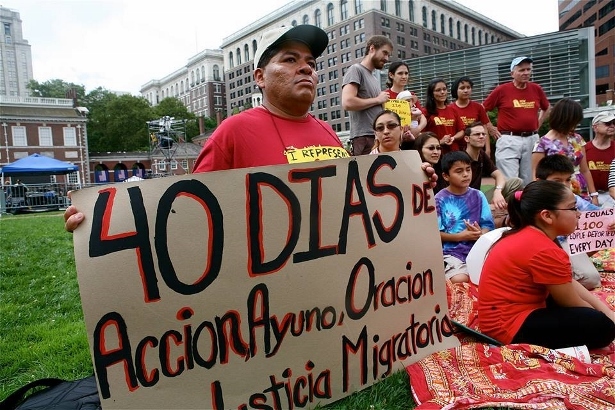 Undocumented immigrant activists are often asked to distance themselves from each other. Democrats often encourage the movement to stand up for “upstanding” and “exemplary” individuals, by offering a path for citizenship for students or military veterans. In the case of ICE holds, activists were first asked to distance themselves from criminals, or at least those accused of crimes. Even within their own coalition they were encouraged to seek elimination of ICE holds only for the bulk of people not accused of serious offenses. Eighty-two percent of ICE holds are for people with no convictions or petty misdemeanors — mostly traffic violations. In addition to organizing amongst immigrants, PFUN met with advocacy groups who argued for political expediency and explained their campaign intention. After years of coalition-building, they returned to escalated actions to put on the pressure. 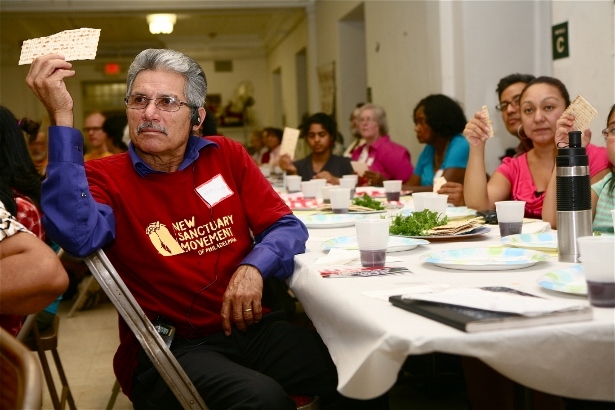 In June 2013, PFUN member organization NSM organized a 40-day public fast. With an eye toward building media credibility on the issue, the prolonged action gave media an on-going, developing story to cover. National and international media covered their un-barbeque the day before the Fourth of July. During this time negotiations with the Mayor’s Office of Immigration stalled. The mayor’s office offered no public movement on the problem and privately only offered the most minor, incremental change. This highlights yet another strategic principle. They risked staying on the mayors’ timetable and dying the slow death of a thousand meetings. To avoid that, they picked a secondary target (council) that could help them put some pressure on their primary target (the mayor). Pressure was increasing, with what was essentially a rebuke from the council of the mayor’s foot-dragging and escalated actions by the coalition, including an act of civil disobedience led by Juntos to block ICE trucks. Rumors soon swirled that the mayor was working on a policy. Late at night at the end of February, ahead of a press conference with the coalition and councilmembers, a Philadelphia Inquirer reporter called Nicole from NSM with a leaked copy of the draft policy from Mayor Nutter. It would eliminate ICE holds for all but those accused of first or second degree felonies involving violence. All the months of organizing, educating and aligning the coalition on a core value sprang into action. As appropriate, the private and public reaction was fierce. Advocates said the bill wasn’t good enough since it didn’t cover everyone. Erika Almiron from Juntos took the mayor to task for his lack of transparency. “The immigrant community should have some involvement and voice about what it looks like,” she told the Philadelphia Inquirer the day after. Subsequent coverage in the media all carried the same message. Groups tempted to readily accept the compromise were quiet. Even a City Council ally was near the coalition’s hardline. This was negotiation out in the open. The coalition offered counter-policy. They weren’t backing down. Philadelphia now joins San Francisco, New Orleans, New York City, and over a dozen other localities in limiting or completely eliminating ICE holds thanks to smart organizing and a commitment to not cede the high ground.